Queen Himiko was the queen of Yamatai kingdom or “country” (or state) who symbolized the unity of the Yayoi people. “In the middle of the Lo-lang sea there are the Wa people. They are subdivided into more than a hundred ‘countries'[called communities in some translations]. Depending on the season they come and offer tribute”. Thirty of these countries were known to have had direct contact with China. Historians equate these “countries” with chiefdoms. The Chinese Wei Zhi accounts in 297 A.D. asserted that Yamatai kingdom was the strongest of those countries. Yamatai country was victorious after years of warfare. Gishi no Wajinden noted decades of warfare had ensued until “the people agreed upon a woman for their ruler”, i.e. when Queen Himiko came to the throne. 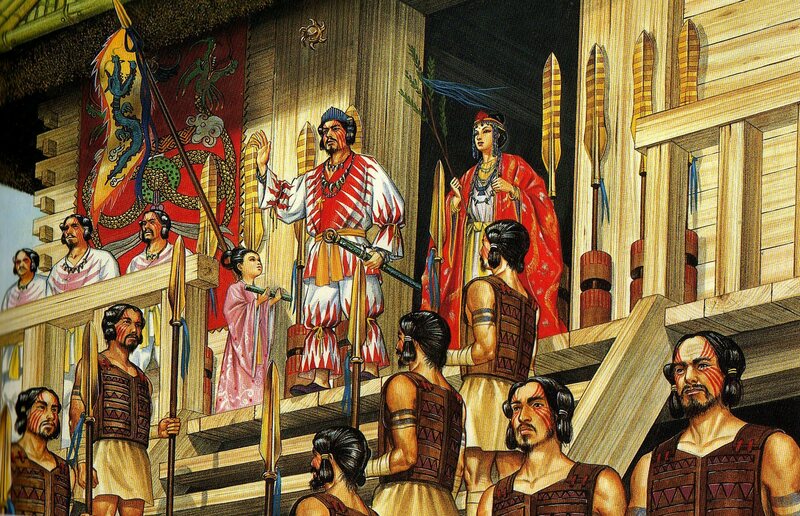 Towards the end of 2nd century, around 30 small chiefdoms had allied with each other to form a confederated kingdom or state known as “Yamatai country” (Yamatai koku) with Queen Himiko at the helm. Queen Himiko may have held the ceremonial role of a shaman priestess, prophetess or perhaps, a pre-eminent shrine maiden with proxy access to the gods for the people. Gishi no Wajinden described her as a having “occupied herself with magic and sorcery, bewitching the people”. Shrouded in mystery, Queen Himiko was said to have controlled the kingdoms by sorcery and magic. She was seldom seen in public and was attended by “one thousand attendants, but only one man”. Although Queen Himiko left the execution of the affairs of state to her younger brother, Queen Himiko very likely held actual power in addition to her ceremonial and religious role. She was guarded by a large army and the Chinese thought of her as a ruler with extraordinary power. Yamatai kingdom prospered under Queen Himiko’s rule and was observed in the Gishi no Wajinden records to have had more than seventy thousand households, well-organized laws and taxation system and thriving trade. Her people were noted to have been mainly gentle and peace-loving. Thus Ito held an important role in international relations. During her reign, Queen Himiko sent envoys to Gi to limit the influence of a rival power, the “king” of Kunu whose country of Kuna (Kuna no Koku) lay to the south of Wa. In 239 A.D., an emperor of Gi granted the Yamatai kingdom a honorable title “Sin Gi Wa O” along with a gift of 100 bronze mirrors. By 247 A.D. Queen Himiko’s realm and that of the country of Kuna were at odds, but the outcome of that conflict is not known, only that she sought Chinese imperial support and that she died likely in the year following that. When Queen Himiko died, her people constructed a large burial mound (about 100 meters in diameter) for her. One thousand female and male attendants were sacrificed for burial along with their queen. She had lived between A.D. 183 and 248 without having ever married. Upon her death, the male ruler who took her place did not last long and the chiefdoms fell into disunity and fighting. “Assassination and murder followed; more than one thousand were thus slain” according to Gishi no Wajinden. When Iyo, a 13-year old girl related to Himiko was placed on the throne, peace was restored and the fighting ended. The location of Yamatai kingdom (as well as that of the burial mound of Queen Himiko) remains a mystery and is the subject of a huge academic controversy as to whether northern Kyushu or Kinai had been the actual headquarters of Queen Himiko. Further reading: The Yamatai Puzzle: Where were Himiko’s headquarters? Himiko and Japan’s Elusive Chiefdom of Yamatai: Archaeology, History and Mythology by J. Edward Kidder, Jr.
State Formation in Japan: Emergence of a 4th-Century Ruling Elite by Gina Lee Barnes pp. 104-128. Barnes does a detailed job examining the different types of mounded/moated and various types of tombs of the 3rd- 4th centuries, the correlation with pottery types, with a focus on the excavations and artefacts from the Hirabaru mound and the Hokenoyama and Hashihaka tomb mounds in the Makimuku tomb cluster mounds. In so doing, she evinces a conclusion from the evolution of tomb forms and by deriving a general picture of social interaction patterns and the state of power relations by analyzing the trade missions and relations as well as tomb structures, material wealth and grave goods available to ruling powers of the time. Women are close to divinity! One of the shrines in pref. Izumo keep a legend of landing of Yuezhi worriors ashore. Altaian Tatun tribe is named Japanese Katuragi tribe. Because consonant “n” is interchangeable with consonant “r” in Korean and Japanese. By Sinocentrism, they are mainly Beidi, having some Xirong elements in the southwest and some Dongyi elements in the east which was the Transbaikal deer herder, plitochniki or slab stone culture tribe. Corret spelling – Katun. Sorry. In sinocentrism term, Jimmu’s bird totem is of Nanmang. When you deem paleo-Qiangic haplogroup as Xirong, we can say all of 4 barbarians, Dongyi, Beidi, Xirong and Nanmang have gathered together to Join Jomon to form Yamato. 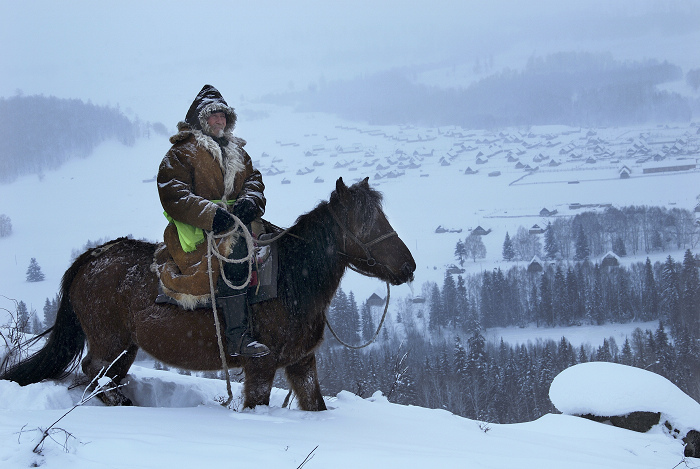 After 4 centuries of this Altaian progeny rule, the court was changed to Transbaikal Deer Herders progeny, which continues until now. May be the progeny of glorius Priestess Shaman Queen Himiko are now flying above us like lines of migrant birds, following the firebird. Yayoi ended as bronze bells changed to bronze mirrors in Yamato. Spouse of the founder of imperial house Jimmu is set forth in chronicle as was from one of the bronze bell manufacturing center in Osaka around 200 AD. So Jimmu and subsequent 4 emperors should not have known what bronze bells were about. According to the chronicle, Jimmu was heavily wrapped in bird totem culture, quite different from Korei’s. Without Jimmu’s baptism, there would have been no Himiko at all. There is a smaller archaic tumulus Hokenoyama, to which Himiko’s big one is directed. This may be perhaps the Jimmu’s. While marching along a ridge from Kumano to Yamato, the chronicle says that an ibex holding a shining in 8 beams crow guided Jimmu troop. This suggests altaians helped Jimmu in his taking power over Yamato. 8-beam crow is suggestive of a hereksur, symbolizing the sun. should be interpreted nothing more than sun worship hereksur way of thinking. The chronicle says this ibex with crow is the ancestor of Duck tribe, the founder of duck shrines in Yamato and Kyoto, the Kamo clan. Himiko/Pimiko is Ainu name Pi-mik-kwr [pi-mik-kur]. It’s a typical aristocratic Ainu name ends with formant ‘kwr’ – ‘a noble person’. Pi means ‘to solve problems’ and mik means ‘to cry loudly’ or ‘to bark’. The only reason I got interested in this was cause I played the 2013 Tomb Raider game and she was one of the characters in it. Who is the first (?) king Japan came from outside in ancient time, who also carries Aryan blood? Please reply. Two of them, R1a and R1b, descended from the R1 haplogroup, which is shown in Figure 1. R1a is the group, conditionally called the Aryans, which em- braces about 50% of the current population of Eastern Europe. This group has the same DNA as the legendary Aryans, who arrived to India around 3500 ybp. Currently, approximately 72% of the some upper Indian castes belong to the R1a haplogroup (Sharma et al., 2009). According to Genebased.com data (Learning Center :: Genebase Tutorials, Figure 1 the page seems to have moved), there is only trace presence in Japan of the Aryan?Turkic-Mongol-Altaic? warring horseman culture. We have no R1a or R1b dna from the Kofun period kurgan tumuli as yet, because the largest and most elite tombs are considered to belong to the royal family who, according to archaeologists, have largely not allowed the tombs to be excavated. Most of the DNA to come out of Japan during the period is consistently Northeast Asian-Tungusic(Baikalian/Buryat-origined) or North Chinese/Korean-Tungusic-Altaic. 4) From here, 2 R1b migrations: the first one to Balkans and Italy and brings R1b-ht35 in Europe, the second one to Caucasus, Near East, North Africa and Iberia. Then R1b-ht15 spreads in occidental Europe with Bell Beaker culture. 5) R1a migrated to North Europe and produced the Corded Ware culture, then he went eastward to the Steppe between 5.000 or 4.000 years ago and produced the culture of Andronovo. Then R1a spread to Iran and India. Anatole Klyosov thinks that R1a spoke proto IE language and R1b spoke proto turkic language. He doesn’t agree with Kurgan hypothesis. He sees that R1b migrated from east to west and that R1a migrated from west to east. Although there is no significant R hg presence, on the mtDNA side, there is a great deal of hg C and D, which indicates perhaps the kurgan pastoral nomadic cultural diffusion and influence from the Altaic Mongolic tribes who lived close to the Turkic ones, or else who descended from the Proto-Mongoloids before they split to go west and east. I will take an open and equivocal position on these scenarios. According to other DNA studies, in terms of affinity with North Asian or NEAS genetic component(apart from its Korean lineages), the Japanese are closest to the Khalk Mongolians (see Yoshio Tateno, 2014), other work suggest affinities to Xiongnu or Hunnu and Chandman Egyiin Gol DNA. I should add that what is even more intriguing perhaps, is the E. Eurasian genetic component N9a, M9,10 sequences)arriving from the opposite direction, from Korea and Japan even, and detected in E. Europe, in the Koros Culture (another study dates the excavation to the later Sarmatian, 1st-4th AD period), see Derenko’s study on rare E.Eurasian haplogroups found in N. Asian populations. A further note to the above. Examining the prevalence and types of viruses can help corroborate the data analysis from Y and mtDNA and help confirm regional contacts, affinities or origins. I came here whilst playing ” tomb raider 2013″. Go play it and get a good view of the island nd its architecture. Its worthy. I think Hollywood is about to release tomb raider reboot very soon. I believe Himiko’s grave was found in the 1950’s as they uncovered a grave with brass mirrors….